Now I am an adult, of sorts, I can choose where I go on holiday. I’ve never been one for the sun, burning when my factor fifty isn’t reapplied after thirty minutes, and the seaside hasn’t appealed since a cold weekend Youth hostelling in mid Wales where the main attraction was the train station taking people away from the town. I had settled instead on a canal journey; if John Sargent could navigate a boat around Britain then so could I.
I have loved the inland waterways for as long as I can remember; they are my not so secret passion. 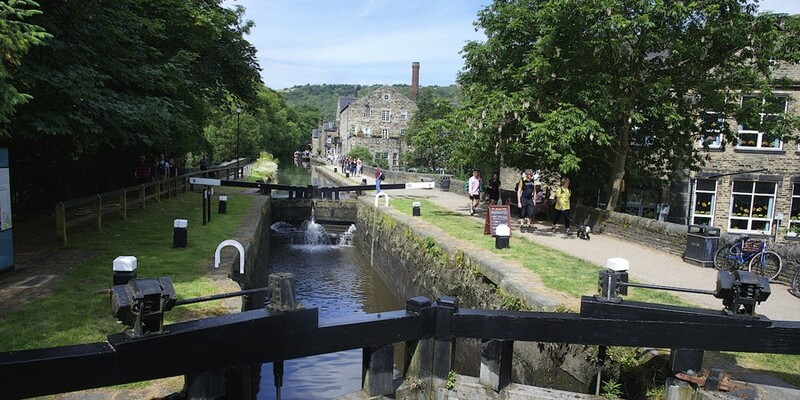 At the age of 15 I tried to convince my parents to move to Hebden Bridge to a house that backed on to the Rochdale Canal, but my dad told me the front door would get ‘too dirty’ living on the main road to Halifax. So instead we moved to a house on a different main road miles away from that snaking stretch of water across the rugged Pennines. As a northern patriot and a lazy person, I chose to hire a 40ft narrowboat on the Lancaster canal. This was partly because of the canals lack of locks and partly because it’s close to where my family live, so, should I come into any grave danger, they would be able to contact someone more competent than them to help me. The Lancaster canal is different to most in that it is cut off from the rest of the canal network. As a result, it is very quiet. However, my first real day on board coincided with a very popular long distance walk along the canal towpath, providing a complementary audience trudging past to gongoozle at my slightest mistakes. One such example came when approaching a narrow bridge near Hest Bank. Having misjudged a meander, I approached the bridge at the wrong angle and was heading straight for the stone arch. After a great deal of reverse throttle and sending a sibling up the gunnels to push the boat away from the bridge, we were well and truly stuck in the thick weeds at the offside of the canal. This no doubt brightened up the day of a few weary walkers, and thus was an act of gracious public service by myself. Boating is a truly beautiful experience, ambling down from Tewittfield in Cumbria to Galgate in Lancashire, the vast expanse of Morecambe Bay stretches to the West while the Yorkshire Dales and the summit of Ingleborough mountain poke through gaps in the hedgerow to the East. Possibly the best place to moor on the Lancaster Canal is ‘Deep Cutting’, a part of the waterway with no road access, named so because the section was cut through glacial deposits, and is, you guessed it, very deep. This section has no road access, which my mum discovered when she came to visit, plodding up the towpath with her sandals caked in mud, declaring that she was not a fan of this boating lark. It was, however, very tranquil, the only noises being the rafts of ducks and moorhens and the sounds of me shouting ‘ouch’ whilst foraging for wild blackberries having pictured myself as the next Bear Grylls. Life at 4mph makes for a very relaxed holiday, and after a few days on a boat the body produces an involuntary swaying whenever on dry land, to make up for the lack of water below the feet, which is perhaps why many boaters enjoy a tipple in local pubs, to steady themselves. Your body gets used to the change in rhythm, becoming attuned to the pace of the boat. Time becomes fluid with days merging together. For a week, provided you have some level of practical skill, you can live on water, acceptably shout a cheery hello to anyone that passes your home and enjoy a vast array of waterside pubs whilst getting away from the trappings of modern life. What more could you ask for? Previous Meet the Team: [qmunicate] editors!